Are you confused about the whole ESMA changes that apply to Forex trading? Do you want to avoid the changes altogether? ESMA was designed to keep traders like yourself safer and reduce your risk in the market while trading, so the new ESMA rules are a good thing right!? Brokers that the new ESMA will apply to. Brokers that the new ESMA rules will NOT apply to. 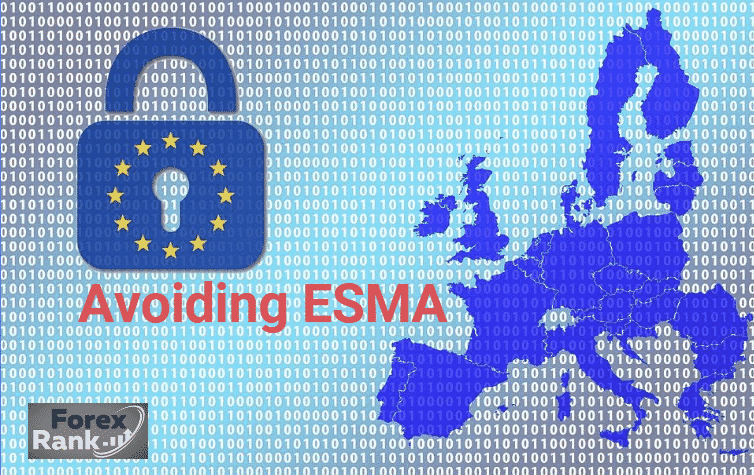 There is also more in-depth information on ESMA and tips on the new regulations down below! For many years, generous amounts of leverage have been an attractive aspect of the Forex market. They have provided a lot of profit potential for winning trades, but also increase risk when those same trades go south. A trend is emerging among the regulatory agencies that govern the Forex markets around the world. Under the guise of stabilizing the retail Forex and CFD markets, many agencies are beginning to implement limits on the amount of leverage that can be offered to clients, as well as other restrictions. How Can I Avoid ESMA Regulations? Placed at least 10 CFD or Forex trades of a significant size on average per quarter in the last year. Investment portfolio of cash and financial instruments over of 500,000 EUR. Do you or have you worked in the financial sector for at least 1 year professionally. These criteria will be out of reach for most retail clients. You will either have to find a broker thats not affected by ESMA (see chart below) or Trade with a ESMA regulated broker where the bottom rules would now apply (see below). What Are The New ESMA Rules? WIll ESMA Rules Apply to Me? If you Live in a country that falls under the EEA (European Economic Area) and the broker you are with is regulated within the European Union, then yes, the rules will apply to you. The rules will also apply to clients outside the EU Only if the Forex broker is solely regulated by the EU. This means a Forex broker that is also regulated outside the EU does not have to follow ESMA regulations. Some Forex broker are regulated in several different countries. The Financial Conduct Authority, which governs financial markets in the UK, proposed changes to the rules that govern leverage. The response to this from firms and individuals involved in the retail Forex industry was understandably negative. ESMA, the European Securities and Markets Authority (ESMA) launched its own inquiry into the issue. FCA subsequently responded by suspending its own, so that it might wait and see what ESMA came up with, while reserving the right to act if they felt that ESMA did not go far enough. The FCA’s previous proposal, in December 2016, called for a 1:25 limit for CFD traders with less than 12 months experience and a 1:50 for all CFD traders. FCA is a national regulator, while the ESMA regulates financial markets throughout the European Union. That means that FCA’s regulations are superseded by those of ESMA and the latest regulations approved by ESMA have led the FCA to become concerned, particularly with the 1:30 leverage cap on major Forex pairs. They fear that such a stiff cap will lead to accounts going offshore in search of higher leverage. Brokers have been encouraging their clients to submit comments to ESMA and make ESMA aware of their displeasure with these limits. The Cyprus Securities and Exchange Commission distributed a circular to inform their clients that even those clients outside of the EU are also bound by the regulations to be implemented by ESMA if they trade through EU-based firms. The document also reminded CIFs (Cyprus Investment Firms) that the ESMA regulations supersede any regulations of CySEC and so the ESMA regulations will apply to CySEC members as well. The CySEC had previously limited leverage to a default of 1:50 (2%) for both Forex and CFDs in November 2016, with the expectation of being implemented by January 2017. Higher leverages were possible if clients requested it and if the clients passed a suitability test. Bonuses were also eliminated. CySEC, as a national regulator, is superseded by the judgments of ESMA with regard to regulation of financial products. The CySEC has been very supportive of the ESMA’s strict regulation decision, in contrast to the FCA. Major changes are coming to the Forex and CFD markets, particularly in Europe. It will likely be only a matter of time before regulators in the U.S. and Australia also face this wave. Whether the Forex brokers and the regulators can avoid increased limits and regulation is anybody’s guess.